a) Generally, both the floor area to be dedicated to a traditional shower and the space needed to properly use it (access and exit from shower box) must be foreseen at basic design level or has to be obtained by carrying out heavy modification works, changing the bathroom layout or the position of bathroom furniture (i.e. water-closet, bidet, wash basin) and relevant feeding and discharging systems. This often determines higher expenses or, in the worst case, the impossibility to carry out the works (when, in existing bathrooms, the spaces cannot be enlarged or when main systems are unfavorably positioned). 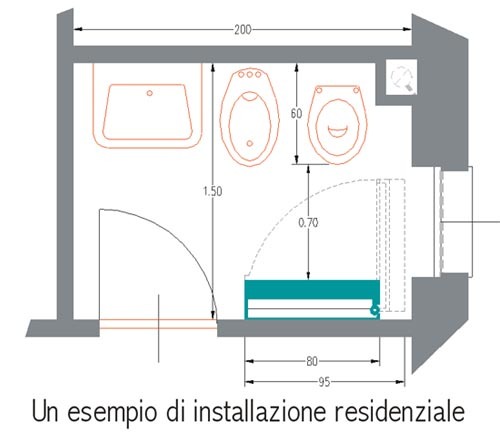 b) If access to water-closet and wash basin must be granted to disabled users also, to get the required maneuvering spaces it could be necessary to install an open shower with floor level scupper, even it the specific regulations are not strictly requiring it, at higher costs. c) Generally, in narrow spaces, boats, hotels, caravans, house trailers, temporary or emergency installations, shower needs a valued space also when not in use.